Due to Canadian oil sands being transportation-constrained, Canadian crude prices had traded at a steep discount to U.S. oil, reaching a record difference of more than $51 a barrel in October 2018. But that gap recently narrowed to less than $7—the lowest since March 2009—due to a production cut of 8.7 percent that the Alberta government imposed on oil producers to lift depressed prices. The cut began on January 1 and is to last for one year. The pucks are not dangerous in the event of an oil spill because they float and are sealed in their protective plastic wrap. They are a bulk commodity that can be shipped in open rail cars and transported like coal or grain. They are designed to absorb the weight of being stacked on each other. They offer a way to ship Canadian oil sands to Asia where there is no discount to U.S. crude. If spilled into the ocean, the buoyant pellets can be retrieved by vacuuming them. On land, they can be picked up by hand or with machinery. 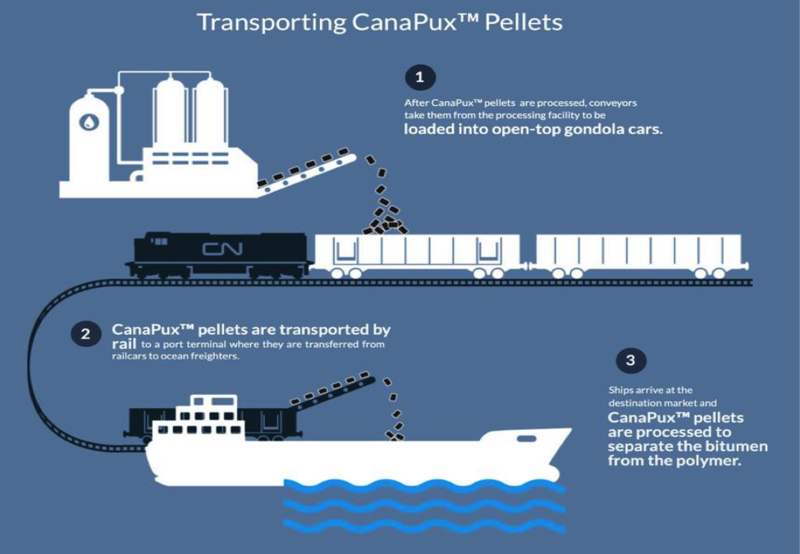 Because oil pucks would be transported in gondola cars which weigh less than an oil car, more crude can be loaded, cutting the shipping costs to almost half the expense of rail transportation in liquid form. 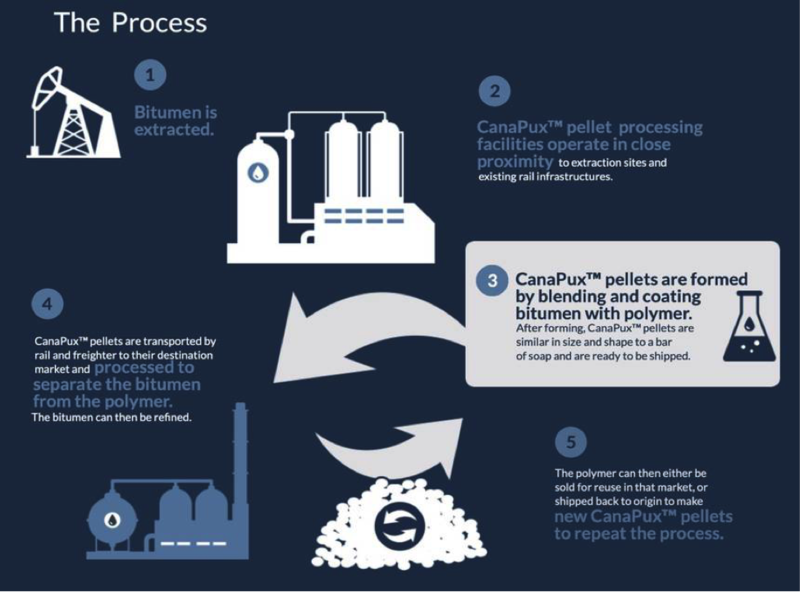 However, CanaPux still require government regulatory approvals and oil refineries will need to make changes to convert solid crude back to liquid for processing. A pilot plant that would process 10,000 barrels per day of oil sands into Canapux is in the planning stages and will be located at either the Alberta crude storage hub around Edmonton or on an oil producer’s site. The price for construction of the plant is estimated at less than C$50 million (US$37.8 million). It could be operational in 2020. Since there is insufficient pipeline capacity to move oil sands to refineries and markets, a lot of the sands oil is being shipped by tank car, but there are not enough of them. Crude-oil shipments by rail rose sharply six years ago because of the lack of pipeline capacity in North America. The increase was spurred by rising petroleum production in oil sands and in new oil fields that lacked pipelines, such as the Bakken Formation that touches parts of North Dakota, Montana, Saskatchewan, and Manitoba. Despite President Trump pushing for construction of the Keystone XL Pipeline, a judge recently put a halt to the project, requesting additional environmental reviews. Another pipeline, Transmountain, is currently caught up in internal fights in Canada. An innovative way to ship oil sands is in the works. If proven viable, it will be a method of getting Canadian oil to market without pipelines, which are being attacked by environmentalists who want to keep hydrocarbons in the ground.